How do you search for a name? Turns out that my friend Daniel Tunkelang has an interesting name. How often how you met anyone with his surname? Not often I'll bet. I draw a couple of insights from this little back-and-forth. First, social search really can help, particularly with problems that are broad and require insights from multiple people with different backgrounds and perspectives. It helps to put such questions to a wide audience where individuals can recognize parts of the problem they can handle and then feedback their answers (or partial answers) to the collective. Secondly, Gene comments that Google helped him find various resources to do the research, but one of the guiding principles for him was that he often recognized specific sites (e.g., JewishGen.org) as having particular properties (both in terms of coverage and utility for this problem). Given the wealth of links that Google returns, having a little bit of background knowledge to help negotiate the links is really valuable. While search engines are great, domain knowledge still counts for something. Thanks to both Daniel Tunkelang and Gene Golovchinsky for their marvelous posts. Quick note: I'll be out-of-the-office for the rest of this week at Burning Man, so I won't be able to do my regular Wednesday Challenge. NEXT week we'll have a good one, so stay tuned! I went to my local, public library the other day. You might ask why a Google guy would visit the archive of ink-on-crushed-trees, and the answers are pretty simple: I go for two key reasons -- (1) Because they have things I can't get otherwise and (2) because they have reference librarians. In the category of things-I-can't-get, here's the list of things I picked up: 3 CDs of chamber music (Mozart, Shostakovich and Hindemith), a set of lectures on CD with notes (on the topic of Chamber Music), and two books of limericks. Yes, I could have bought all these things through Amazon or equivalent online--but it would have been well over $200. Through my public library I also have access to a set of databases that are invisible to Google--they don't license their data or access to their data, so there's no easy way to get that kind of information without going through the library. There are great genealogical resources there, as well as full-access to all of the New York times going back to 1851. Want to read the story of Fordlandia (the ill-fated city-of-rubber than Henry Ford built in Brazil in the late 1920's)? Read the original coverage in the Times. It's $3.95/article if you don't use your public library. And, lastly, reference librarians are both incredibly well-informed about the infoverse AND incredibly happy to tell you everything they know in order to make you a better researcher. I like that. I like it a lot--they're not out to make a dime from every transaction, but they're genuine saints who want nothing more than to teach you how to do the search on your own and make you self-sufficient. You have to admire that in these days of unrelenting grabs for every last surcharge for expertise. I have many reasons to use my local library--but perhaps the best is that it's a place where I always learn something. (The last time I took a class on Search at the library, I found out that you can use the * within the scope of double quotes--a la [ "Obama said * about Israel" ], which will find all instances of that phrase with something matching the asterisk. While it makes sense (the double-quotes prevent synonyms from triggering), I didn't think the asterisk would function correctly within the quotes! It's a place where I can see the latest books, magazines, music, video and all the regional news. Answer: Where did seedless grapes come from? I read the Wikipedia article which tells me that sultanas--also known as Thompson seedless--are probably the most common (widely grown) kind of seedless grape. (This gets a little complicated because the word "sultana" really refers to a kind of Turkish grape, AND is the common name for "raisin" in much of Europe.) But after poking around a bit, it's pretty clear that while seedless grapes have been around intermittently (as mutant variants that didn't breed true), the Thompson seedless is the dominant kind of seedless grape. I'm hoping to find some nice general articles about this variety of grape, maybe with some background. The first hit is an interesting, if somewhat technical article from the University of California Cooperative Extension. It's useful (if you raise Thompson seedless grapes in volume), but not useful for our purpose--there's no history here. The other articles on the SERP are similar--interesting, but not useful to us. How about the query: [ Thompson seedless history ] ? Here, the first hit is from Raisins.org (which turns out to be a page from the Raisin Administrative Committee in Fresno, CA, not far from where I saw all the grapes). On this page they mention that William Thompson (an immigrant from Scotland) introduced the Lady deCoverly seedless grape. Interesting. Should we believe the story? Maybe. They're located in Fresno and have historical ties to the grape industry, so it makes sense that they'd know. But let's dig deeper and triangulate this bit of information. "Thompson... in 1872 sent to New York for three cuttings called Lady deCoverly of which only one survived." Even better, they claim that the first Thompson grape was grown on his farm near the site of the marker: 39° 8.723′ N, 121° 46.924′ W. near Yuba City, California, in Sutter County. While I might not trust their agricultural history, I do trust their location markers. 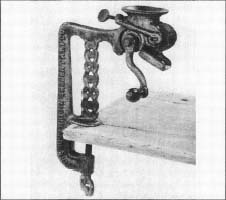 But this page also gives a link to the Sun-Maid Raisin company's "History of raisins and dried-fruit" page which claims that Thompson got his original vine from the "Almira & Barry Nursery" of Rochester, New York. The plot thickens. 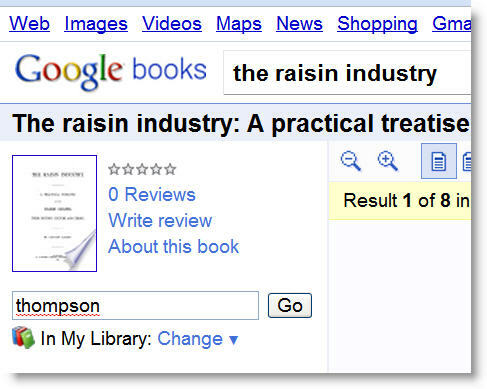 Continuing down the SERP, the 5th result links to an eZine article on the history of grapes for raisins. This article, by writer Patrick Malcolm, argues that Thompson renamed/remarketed the grapes from the Lady deCoverly as "Thompson Seedless." When I dig a little into the background of Patrick Malcolm (to see if HE is a credible source), I quickly find that he's written many, many articles on the history and development of different kinds of plants--especially agriculturally important plants... so I'm inclined to believe him. 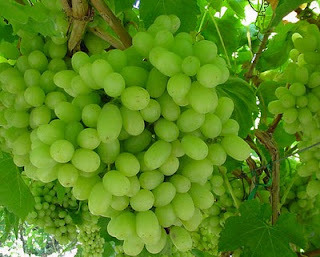 The 8th result on the SERP is a link to MadeHow.com, which claims that Thompson seedless is a Muscat vine grafted onto an English grape variety. But THAT doesn't make any sense--how would you propagate something like that's a graft? We already know (from the other web pages) that Thompsons are made by taking cuttings off the original vine--a graft won't copy itself like that, so that story doesn't make any sense. 2. What's the story behind its production? 3. If it diverged from a previous kind of grape, what was that progenitor? AND that the context of this question was "I saw seedless grapes in the Central Valley." At this point we already have a strong clue that Thompson seedless are originally Lady deCoverly, then renamed by William Thompson around 1875 or so. This is almost certainly not the first or only seedless grape, but certainly the first commercially produced seedless grape. Thompson's farm was near Yuba City (see the exact location above). So we've just about answered all our questions. The place of its "renaming" was there, near Yuba City. The only odd thing left is the name of the nursery--"Almira"? "Elmira" is a city in upstate New York, but it's not a nursery. tip: For historical questions like this, it's often really good to look in Google Books. This book was published in 1890 in San Francisco, so it's both near the scene of the crime and in the right time. For search purposes, this little tale shows that there can be multiple versions of the story ("it's grafted!" "it's Lady deCoverly!") For historical reconstruction, it's really not enough to just read the first hits, but you need to keep digging and cross-checking. Note that "Ewanger & Barry" is correctly noted in this document, which correlates with what I happen to know from having lived in Rochester, NY! The search never ends... you just get confident enough to make the claim. Search Challenge (Wed Aug 25, 2010): Where did seedless grapes come from? As I was driving through California's central valley the other day, I went past mile after mile of grape vines, rolling off into the distance. Some of these were industrial wine grapes... but the vast majority were (I knew from reading elsewhere) seedless grapes for eating (either fresh or as raisins). And that made me wonder--what's the backstory on seedless grapes? It can't be an evolutionary boon to be seedless after all, so it must have been some human intervention that made seedless grapes possible. So for my own education I wanted to look up the story about how seedless grapes came to be. If you were a reference librarian, you might think "uh oh, this is VERY ambiguous." And you'd be right. But this is my internal intent, my only slightly-processed question. A big part of the sensemaking story (particularly wrt search) is how to transform your vaguely-described-task-intent into actions and search questions you can actually satisfy. Here's what I did. This took longer than I thought, so it's a nice problem. The goal is to find the documentary "American Tongues" -- so I thought I'd check YouTube first. It won't be the DVD, but maybe it'll give me a pointer to a website that'll rent it to me. 1. Check YouTube first. This gave me a lot of clips and teasers, but no information that was really useful. 2. Search for [ American tongues documentary ] This worked pretty well, and I found it quickly at the CNAM. (Center for New American Media) You can rent it here for $85.... that seems high (for a DVD??) so I keep searching. 3.After hunting around through the first page of results, I decide to add "rental" to the search... [ American tongues documentary rental ] With this edit I find lots of clips online, but again, nothing is proving to be useful. Interestingly, I find that Blockbuster.com claims to have it, but after spending 5 minutes trying figure out whether or not they have it (and failing), I give up and have a brainstorm. 4. New idea: Check my local library! I do the obvious search [ Palo Alto library catalog ] to get to the online catalog, but I fail here as well. Interlibrary loan? Ugh. Hard to get to and then the search seems to break, so I give up after another 4 or 5 minutes. 5. I return to the previous search results (from step 3) and click on Roger’s Video Direct – Interesting. THEY say it’s available “exclusively” in “P.O.V. 20th Anniversary Collection." I'm not sure I believe that. Information I've seen elsewhere suggests it's available as a "single" -- but this does give me another tack to take (that is, looking for the "POV 20th Anniversary Collection"--but I'll save that for later. But, heartened that they knew that bit of information, I start searching on their site.. .they don’t have it either! Arrgh. All they have is the record of the documentary, and NOT the actual video itself. I keep cruising through sites… All the results are fairly low quality and I'm starting to get discouraged. It's taken me 20 minutes to get here, and I still don't know. 8. Another brainstorm: check WorldCat.org! They index entire library collections, so I can also search for DVDs! I jump to WorldCat.org, do a simple search for "American Tongues"-- click on the first result, then click on their link: Find a copy in the library. Voila! Success! It's available at the San Francisco public library (and many local university libraries, but this is the only one open and available to me). In any case, the problem with documentaries is that they're often released for a short time into a few theatres, then vanish into some kind of archival abyss... They become difficult to find--at least at reasonable cost. Minor rant: Many documentaries seem to be rentable for $85. I don't understand that pricing at all. I suspect that there's a market for documentary video rentals that's reasonably-priced, and not exorbitant. Does anyone understand the economics here? I wandered into my manager’s office yesterday and mentioned that I read on article about how mathematicians have a new wiki-like website to jointly solve big, hairy, complicated problems. He was skeptical. “I ran something like that back in the day…and it petered out after a while. Still, what’s the URL?” He turned to the keyboard waiting to hear. And I couldn’t remember. So, being a good researcher, I started searching and found that it didn’t pop to the top. It was an article I’d read within the past couple of days. I thought I’d read it in Newsweek. I knew it was about math, and probably had the words Wiki or Blog in it since it was about working together. The article was about mathematicians working collaboratively. I just wanted to find the article. Should be simple, no? Well… it wasn’t. Let me recap my search for you. I had a half-baked notion that the wiki/blog/thing I was looking for was called “polymath” (it would be a clever name), but the results looked unpromising. So..
I’d searched for about 15 minutes at this point and… I gave up for a bit. Just to let my brain stew on this for a bit. This is sometimes a good idea. I came back to the search after an hour with a new search term in mind: “crowdsource”! So I tried the obvious first search, using the new search term and adding in Newsweek to restrict the search. Again I limited my search to the last week. (I didn’t use a SITE: restrict because I didn’t want to overly constrain the search to JUST Newsweek. I thought that perhaps a newspaper might mention “In the recent Newsweek article…” And I’d be good to go. Which showed me a link to the Interceder site (a news aggregator site) that collected information on (in this case) “crowdsource” article. I scrolled through their collection of articles, and finding it long (and tiny font! ), I used Control-F to look for “math” in the text. Now... what’s odd here? Why was this search so hard for me? Retrospect: Looking back, what could I have done differently? And, in the end, all of my floundering around with terms like “Newsweek” and “wiki” were not productive. The article I really was trying to find (the newspaper article) wasn’t on Newsweek at all. I should know better: Let the search engine search… that’s what it’s good at. I should have focused my efforts on looking for better terms to describe the thing I was looking for. “Crowdsourcing” turned out to be the key term that got me to the target. Sometimes, I have to take my own advice. Folks... This isn't my usual Wednesday search challenge post. I was away all last week, NOT thinking about search challenges. But I did do a bit of music, and spent more than a few hours trying to make sense of what I'd been taught. SO here's an essay on what happened last week. Or at least one part of it. I’d slept in and the sun was already up as I came up from the watery deeps of sleep. As reality faded in I heard harps in the distance. This worried me slightly. Had I passed-on unexpectedly in the night and ascended to a celestial palace with angels in attendance? My eyes opened and I recognized the inside of my tent—all blue and gray ripstop nylon. I somehow doubted that heaven would be so camplike, so I figured all was well, and I was still corporeal. Memory also came drifting into focus. I was at music camp and the heavenly strings were merely the morning celtic harpers class practicing a bit. We were all at a place hidden deep in the redwoods of Mendocino; a place that was quiet, cell-phone free and wifi absent; a place defined by the woods and the music. We camp in tents, walk to the dining hall for meals, use portapotties and live off-the-grid in a world shaped by acoustics, wood, wire and vibrating air. If your idea of a vacation is high-count Egyptian sheets, foie gras for your amuse bouche and hot tubs flowing into an endless pool by the edge of the sea, this is probably your personal vision of hell. But if you want to hear Irish sessions tunes spinning off endlessly into the night while there’s a light mist in the air and a silver flask on the tabletop, then this is just about perfection. Lark Camp is a music camp that serves up world music on a scale you’ve probably not seen before. I certainly hadn’t. There just aren’t too many places where you can, as I did this past week, sit in on classes for Balkan accordion, kihoalu (slack key) guitar, ukulele performance, Irish flute, pennywhistle, Galician dance, Syrian drumming styles, oud, old-time banjo, bodhran drumming, Cajun fiddle, Highland bagpipes (bring your own chanter) and Uilleann pipes. It’s not just that there’s a wide variety of world music, there’s an overwhelming abundance of it. One can scarcely swing a cat without striking a person playing an instrument you’ve never heard of, in the indigenous style of a country you’ve never visited and can’t pronounce. Here’s how it works. Several hundred people get together and take over an old WPA/CCC campground in the forest east of Mendocino. I was surprised to learn that the WPA/CCC actually built a bunch of these camps in a socially progressive effort to get people out of the cities and into the woods on the principle that “back to nature” would bring families together and promote social engagement. Now, 75 years later, only the Mendocino campsite still operates with anything like the original intent—the others have either gone to wrack and ruin, or just vanished. Which goes to show either that social engineering is supremely fickle, or that there are some people who just can’t let a good thing disappear. I suspect Lark Camp is the latter—after all, these are people who are all bent on playing traditional music (where “traditional” means before your oldest memory), and so a traditional New Deal WPA constructed campsite is just the thing. I somehow managed to miss the music camp experience as a kid, so I’ve seized the chance to recover my missing childhood with a week immersion in music. And that’s exactly what it is—7 full days of music from the moment you wake up (hence, the harps in the morning), all through the day, and then as you go to sleep, music in the distance plays you to sleep. My favorite class was bodhran drumming, mostly because I’m so bad at it. It’s one of those things—I think it’s a good idea for everyone to study, at least once a year, something in which they have no skills and no background. And although I’ve played tympani in a few college orchestras, I was never really a drummer. Some people are, some aren’t—and I’m not. But a bodhran is different—it’s a drum with a pitch that you can change my moving your hand up and down on the drumhead. You can actually play a tune.. if you’re good. So it sounded pretty appealing. I love Irish music, and love the sound of the bodhran, and it only has one stick to master, so why not? Turns out that it IS simple, but as with most simple-sounding things, it’s actually easy to be really bad at it and tough to be good. Because it’s so simple, everything—and I mean every little sound—is completely exposed. So we spent two days learning how to hit the drum with the stick. Now really, how hard can it be? Hold the drumstick (called a “tipper”) like a pencil and wave it back and forth, making sure the top of the arc strikes the drum on the beat. Except when you do that for a few minutes, suddenly everything falls apart, and somehow, amazingly, you miss the drumhead, which is odd because you’re holding the drum pinioned between your ribs and your left hand. How could you miss? But you do. So you practice, and practice. And finally, the hitting-the-drum-thing stabilizes and you can do it for many minutes without an error. Then it’s on to triplets—again, a very simple sounding idea where you hit the drum three times (the triplet) in the space of one beat. 1-2-3-4-triplet-3-4… (Except you play 3 beats where the word “triplet” appears in that sentence.) Again, it sounds supremely simple, until you try it and discover that if you do it wrong, you’re heading down the fast track to RSI injury, and if you do it right, then it’s hard to make them even… which is kind of the point. It doesn’t actually *hurt* or anything, but you feel like a complete idiot every time you try to hit the drum on the beat and miss. Happens all the time… and that’s the biggest lesson of all—you have to be willing to sound like an idiot to get to the happy side of good. So that’s the key—a willingness to look foolish, repeatedly, until you finally, after hours of practice, begin to merely seem incompetent. Here’s the other thing. As you practice, eventually you’ll get it. It’s not a cognitive process, but a non-introspectable internal figuring-out. After a while, the 1-2-3-4-triplet-3-4 pattern actually comes out right! And then it disappears again. Damn. And that’s the way it is for the rest of the week while you’re at camp. The skill suddenly falls into place, then vanishes for a while. You *know* you can do it, it’s just that your body can’t quite figure it out. Now I’ve read the memory and expertise acquisition literature. I know about practice effects (both massed and distributed) and so all of this comes as no surprise. But it’s something else when it’s YOUR dumkopf hand that can’t make the simplest of bodhran beats come out right. Once again I re-learn the most elemental of lessons about expertise. You have to practice, and you have to be willing to let the skill come, then go, then re-emerge. You have to be okay with sounding like a fool, and you have to realize that it takes time—there’s no magic here. Realizing that made the rest of my stay at music camp visible through a different lens. When I watched professional musicians learning skills they didn’t have (such as the professional fiddler player who was also in my drumming class), I saw that they were just as incompetent as I. But (and this is a big point)—they knew how to practice. They’d didn’t try to overanalyze, but went with what they could do. That’s when I realized that what they’re actually expert at is *practicing*. The Lark Camp was many things, but discovering once again that you can be a terrible player now, but on the road to expert performance, is freeing. I CAN learn. And I can learn anything. Postscript: I just had to say that while there are many wonderful moments at music camp, one of my favorites was at a concert of Balkan music being held at 1AM in the dining hall. One of the performers left her instrument back in her tent, so she asked the crowd “Anyone have an extra tanbur I could borrow for this song?” And within two minutes, she had one. Ah yes, this is that kind of crowd! Definition: tanbur-- The term tanbūr (Persian: تنبور) can refer to various long-necked, fretted lutes originating in the Middle East or Central Asia.